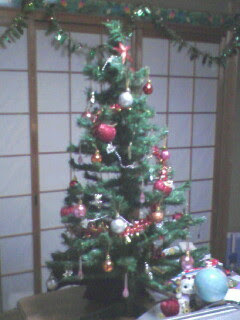 Nothing really blogworthy has happened recently, but I feel bad about not updating, so here is a picture of the little Christmas tree in the classroom. I went all out with the Christmas decoration again this year. It just makes me feel so happy and festive to be surrounded by glittery ornaments and shiny tinsel garlands. 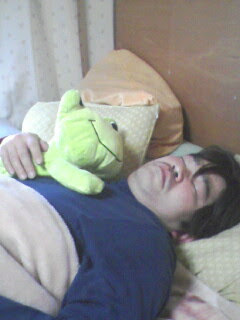 Also here's a pciture of Sho-chan cutely sleeping while holding my stuffed frog. Doesn't it just make you go "Awwwwww!" Don't tell him I posted this picture here, he might kill me.